Happy June! Now that Memorial Day has past we have officially entered BBQ season and I am legally allowed to wear white pants again! It also means… wedding season! If you’re looking for something on the lighter side to enjoy at your next barbecue or dinner – this recipe is for you! The salty/sweet combination with refreshing mint and lime makes for the perfect side dish and the presentation on the skewers makes it look like you spent a lot of time preparing it… so don’t be surprised when people start calling you “Martha.” You could toss these ingredients together in a bowl if you don’t have wooden skewers but its nice being able to pick one up without needing a plate! These are so light and refreshing on a hot day- they’ll be the first to go at your next beach picnic or party! 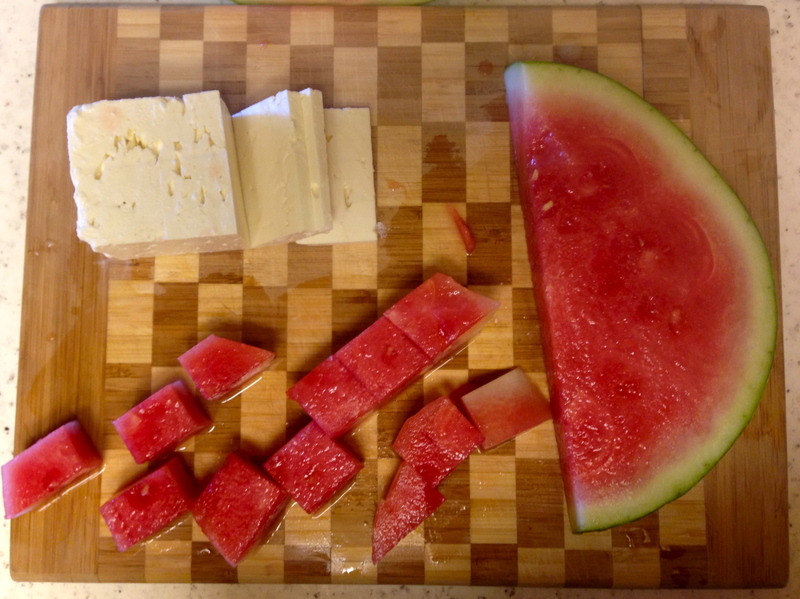 Place one cube of watermelon and one slice of feta on the skewer. You can get about 4 of each on depending on the size of your skewers. 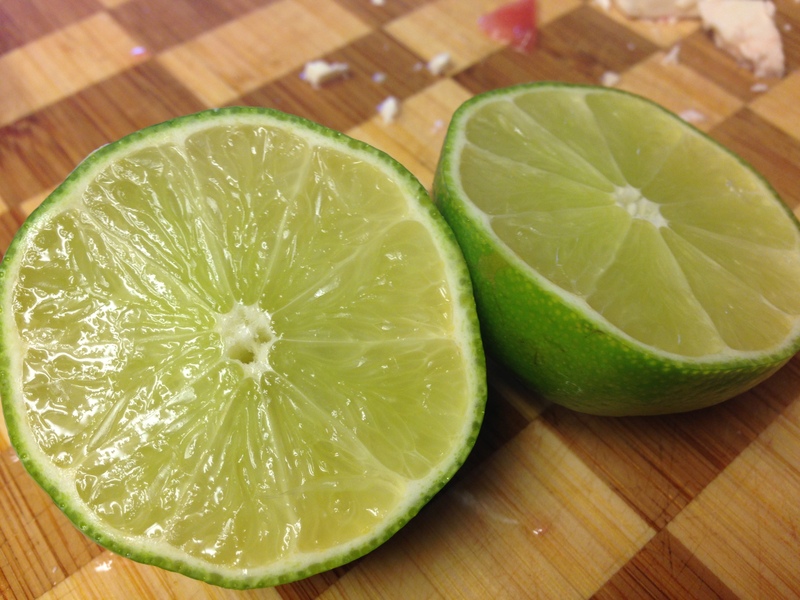 Drizzle the lime juice over all the skewers. Drizzle Olive Oil (2-3 tablespoons) over the skewers and finish by sprinkling fresh mint pieces over the top. Serve and Enjoy! If you’d prefer to serve this salad in a bowl you can used crumbed feta instead of block feta. Toss watermelon, lime, olive oil, mint, salt and pepper together in a bowl, sprinkle with feta cheese and serve. If making ahead of time leave feta off until you are ready to serve or it will get soggy sitting in the bowl. 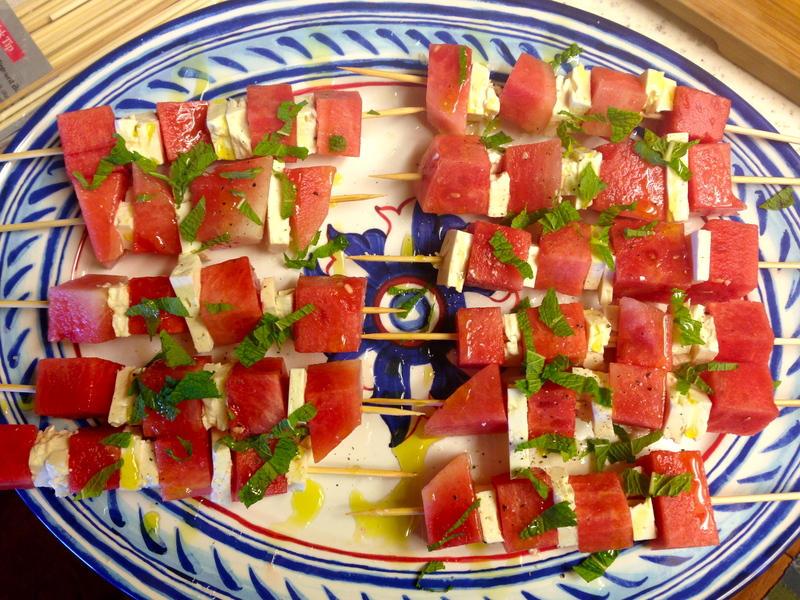 This entry was posted in Appetizers, Recipes, Salads, Sides and tagged feta, mint, salad, watermelon by skibootsinthekitchen. Bookmark the permalink.